RUA | What Does RUA Mean? 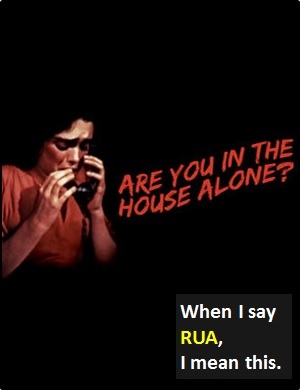 RUA (Are You Alone?) can be a prelude to divulging a secret, stating something personal, or requesting something untoward. Of course, RUA could be an innocent question � after all we all tune our correspondence based on our audience. Nevertheless, RUA is a term that all parents of young children should know. The image shows Gail Osborne from the 1978 thriller "Are You in the House Alone?" Person A: Hello. It's me again. RUA? Person A: Okay, shall I turn my webcam on? RUA is an initialism abbreviation. This means it is pronounced using its individual letters (i.e., Ar Yu Ay). Initialisms contrast with acronyms, which are spoken like words. RUA plays the role of an interrogative sentence (i.e., a question), but it is commonly seen without a question mark. In other words, it can be written "RUA?" or "RUA".